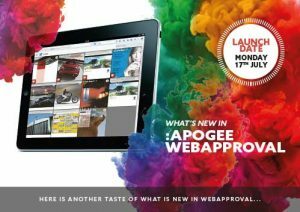 Take a look at ‘What’s New’ with our user friendly Apogee WebApproval. We have also produced a ‘User Guide‘ which walks you through the basic steps. It will be easier to use, to collaborate and supports the very latest web browsers. Apogee WebApproval runs in HTML5 so no longer relies on third-party applications such as Java. The User Interface fully supports Apple and Android tablets, as well as desktop use. De-cluttered User Interface allowing easier process steps. Fully functioning drag-and-drop of pages from desktop into the job. There is an intuitive preflight report which zones the region with a remark. Ability to view and approve multi-language jobs. We are also offering our customers a chance to log into a temporary site so you can familiarise yourself with the new look.